Dunhill Tobacco of London has a rich and storied past, beginning with the establishment of Alfred Dunhill’s original tobacco shop on Duke Street in 1907. Dunhill inherited his father’s horse harness manufacturing business, but he was at heart an inventor. 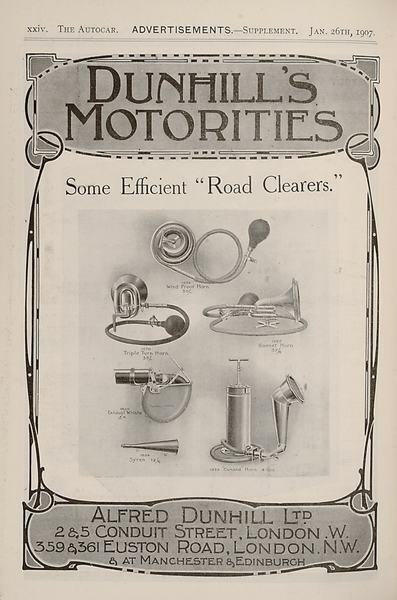 With the advent of the automobile he modified the family concern from harnesses to motorcar accessories, and he invented the “windshield pipe,” which allowed motorists to happily puff along in the wind. This led to his involvement in the tobacco trade, which began with pipes and custom blended pipe tobaccos. Eventually he was appointed official tobacconist to Edward, Prince of Wales, and after Alfred’s retirement the shop would be the acknowledged purveyor (and protector) of cigars to Winston Churchill. 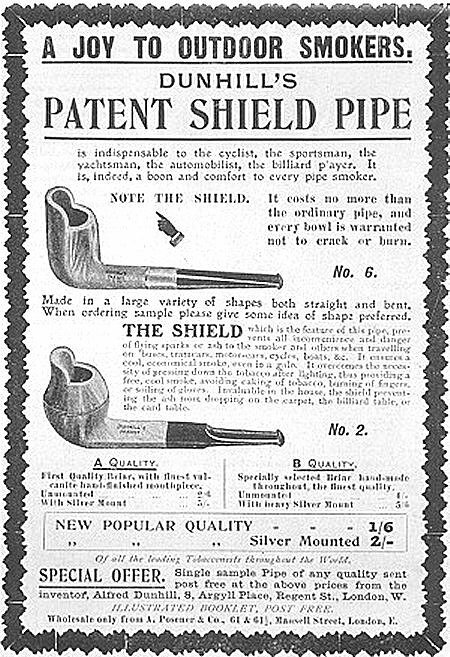 So Dunhill as a brand has historically been associated with pipes (and cigarettes) more than cigars. 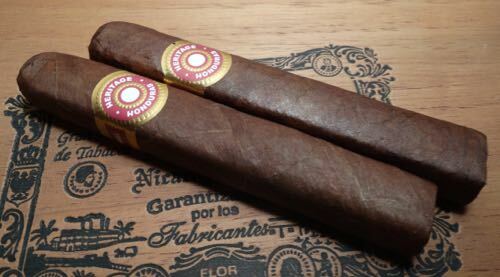 They did have exclusive distribution rights for several blends and brands of Cuban cigars before the revolution, but the Dunhill brand of cigars did not appear until the mid 1980’s, and it lasted only a few years. They entered the market in competition with Davidoff Cigars, and they lost that match decisively. The Dunhill Heritage Robusto is a square pressed cigar with a dark colorado maduro wrapper. The band is classic and understated, very much like the bands on the Don Candido and Don Alfredo lines distributed by Dunhill in the 1960’s and 70’s. The leaf is ruddy, smooth, and attractively oily. Some fine veins provide contrast to the uniform shade of the leaf. The head is well formed, and while the cap is not picture perfect it shears away cleanly. It draws with the perfect amount of resistance, and this appears to be consistent over the three samples I smoked. The burn line wavers a bit, but it burns slowly, and a strong solid ash provides the finishing touch. I smoke so many Nicaraguan cigars that my palate almost expects the flavors of wood, earth, and pepper, and anything else comes as a surprise. Dunhill’s Heritage blend is a little different from what I’m accustomed to: this is a meaty, leathery cigar from beginning to end. Leather dominates the nose in the first third of this cigar. The flavor on the palate is clean and mostly herbal, with a couple turns of the pepper mill for seasoning. The pepper wears off a bit in the mid section of the cigar, revealing a soft note of cedar and some caramel-like sweetness. The smoke texture is medium to full, and the strength of the cigar grows to full by the time the ash reaches the band. Dunhill’s Heritage Robusto reminds me of a good old pot roast. Satisfying, but not too sophisticated. Smooth and well balanced, It’s a full-bodied, full-strength, well seasoned smoke. Excellent construction gives it a boost. MSRP was around $10 per stick when it was first released this summer, but it looks like that price has dropped to a more reasonable $6. At that price it’s definitely worth a test drive, perhaps literally, in your motorcar.